It's a tough job, but somebody's got to do it. Perhaps you've seen them on CSI or Mythbusters. Batman even tried his hand at it in The Dark Knight. Forensic ballistics experts can be found throughout popular culture, on television, in books, and in movies. With the popularity of so many crime shows and films, it's easy to see why someone would be interested in such a fascinating career as a ballistics expert. Forensic ballistics analysis is a specialty within forensic science. 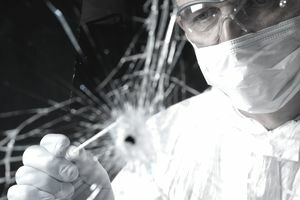 Like most forensics investigators, forensic ballistics experts perform the bulk of their investigative work in a laboratory. The evidence they analyze, however, is collected in the field. Ballistics experts may examine a crime scene themselves, or they may simply analyze evidence submitted to them by other crime scene investigators, detectives, or police officers. Forensics ballistics experts specialize in looking at anything that has to do with firearms, from identification of a specific round or weapon to determining the trajectory of a bullet. Ballistics experts can identify the caliber of a round and, with the help of national databases, can learn where the bullet was manufactured and possibly even the gun that fired it. Additionally, forensic ballistics experts may be involved in crime scene mapping. With computer-aided design programs, photogrammetry and laser measuring tools, ballistics experts can determine the location from which a round was fired or the direction it traveled, making the search for physical evidence easier. These crime scene maps can be used to create diagrams for police reports or courtroom presentations. Ballistics experts may be called to lift fingerprints from spent shell casings or help collect DNA samples from expended rounds. Ballistics experts can expect to work standard business hours, but they may be called to a crime scene at any hour. Often, the scenes they investigate are grisly, due to the nature of the crimes they respond to. Most forensic ballistic experts work for large police or sheriffs offices or a state or federal crime lab. With experience, though, ballistics experts can earn lucrative salaries working as consultants or contractors in the private sector. Many experts work for attorneys or private investigative firms. Like other forensic science technicians, forensic ballistics experts must typically have a bachelor's degree or relevant comparable experience in the natural sciences. Specifically, a strong understanding of physics is necessary. In addition to a college education, ballistics experts must undergo extensive training and maintain a strong working knowledge of all areas related to ballistics, such as types of firearms, types of bullets, muzzle velocities and gunshot residue, to name just a few. All areas within forensic science investigations are expected to see higher than average growth over the next several years. It is due largely in part to continued advances in technology and an increased public interest in, and demand for, better analysis of evidence. Annual salary potential for ballistics experts can range between around $30,00 to more than $80,00, with the average salary near $55,000 per year. It's important to remember that forensic ballistics experts, like bloodstain pattern analysts and other forensic specialists, often start out as general forensic science technicians and work their way into a specialty. Entry level positions as a ballistics expert, then, will be few and far between. Instead, those interested in a ballistics expert career will want to consider entering the workforce as a forensic technician and gain the required training and experience on the job.